Iron is an essential mineral needed for transport of oxygen to tissues, immune function, energy production and cognitive development. 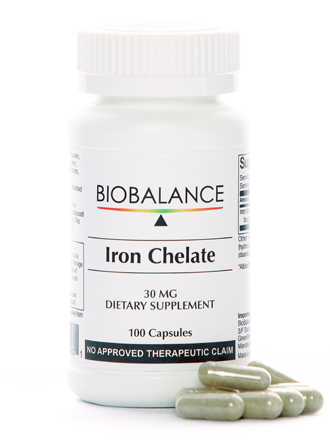 Produced from a special process that completely bonds iron to the amino acid glycine, the resulting iron chelate is an extremely bioavailable source of iron that is well-tolerated and absorbed by the body. While most forms of supplemental iron are irritating to the digestive system, this product provides a readily absorbed form of iron that generally eliminates unpleasant side effects. 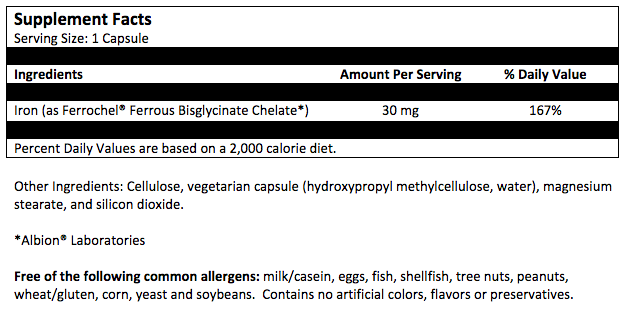 Suggested Use: As a dietary supplement, take 1 daily with a meal or as directed by your healthcare practitioner. 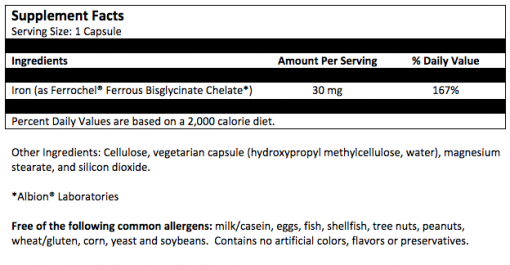 Free of the following common allergens: milk/casein, eggs, fish, shellfish, tree nuts, peanuts, wheat/gluten, corn, yeast and soybeans. Contains no artificial colors, flavors or preservatives. • Accidental overdose of iron-containing products is a leading cause of fatal poisoning in children under the age of 6. • KEEP OUT OF REACH OF CHILDREN. In case of accidental overdose, call a doctor or poison control center immediately.